M23 logs + Help finding the transmitter location! Hey, qsr711 here, just wanted to alert you that M23 is back on air, with transmissions starting on 8030 and 5182 (simulcast) anytime between 16:30 and 18:30 UTC. The first reporting of this station this year was on June 15. Transmissions seem to start at full hour and 30 minutes past the full hour. If you want more info, check http://priyom.org/number-stations/morse/m23. We know that the source of the transmission is France, but the priyom team wants to go a step further. If anyone lives in Western Europe and has the equipment to perform a triangulation study, please contact the priyom team via IRC (irc://irc.freenode.net/priyom) or post your triangulation results here. Keep in mind that M23 can stay on air for several hours, which makes it easier to track down. A heading from Hamburg is the one that has pointed the transmission country to France, but one result isn't enough. The station will be active for at least one week, so hurry up! *EDIT: A new M23 schedule has been found. The schedule is from 14:30 UTC to 15:30 UTC, with ID 246. The broadcasts are made in two simultaneous frequencies like the 943 slot, which are 6806 and 5345 CW. It also starts at half hour and full hour. 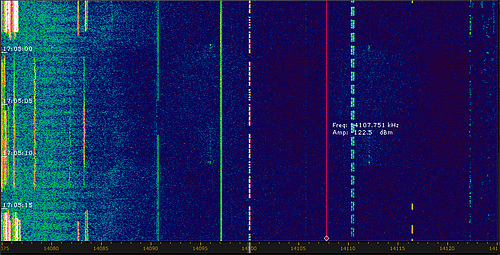 *EDIT 2: The old time slot on 8040/5182 seems to be gone for now, only the 6806/5345 transmitted today. *EDIT 3: The station is back into its large hibernation period, only the test dash before the transmission appeared today (June 15th), which can be transmited for months. The transmission site could be the Feucherolles DGSE antenna field, located in northwestern Paris. Many thanks for the DF results sent all these days! Re: M23 logs + Help finding the transmitter location! I check the priyom schedule today, and M23 is back on the air. Not sure how long will it be on before it goes back into it's hibernation mode.. Yesterday M23 showed up at 16:58 UTC on 14100 kHz with ID 051. This is an exclusive ham radio allocation, used by IARU/NCDXF propagation beacons. Since March 19, 2019, M23 has mainained this "051" schedule on 14100 kHz on a daily basis, from 1658 to 1710 UTC.